We spotted an unadvertised sale and extrabucks promotion at CVS! 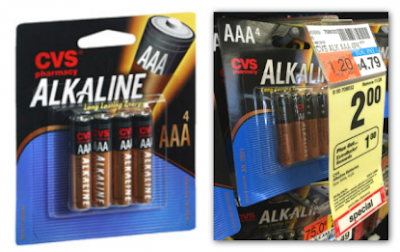 This week, buy one pack of CVS batteries on sale for $2.00 and receive $1.00ECB at checkout. Save over $3.00 on the regular price! NO COUPONS are needed to do this deal either! Total $2.00 plus receive (1) $1.00 ECB making them only $1 after ECB!